Plato was born in the year 428 B.C., in either Athens or on the island of Aegina. Plato was given the name Aristocles at birth. His father Ariston was a descendant of the last king of Athens, Codrus. His mother Perictione was a descendant of the Athenian statesman, poet, and lawmaker Solon. Perictione was also the sister of Charmides, and the niece of Critias, who were soon to become influential leaders of the Thirty Tyrants. Both of their families were very wealthy. Ariston died when Plato was very young. As a result, his mother remarried to her mother's brother, Pyrilampes. Pyrilampes was an important diplomat who had served as the Athenian ambassador to Persia. As a young man Plato developed an interest in wrestling. Twice he was victorious at the Isthmanian Games. After his stint as a wrestler ended he decided to become a politician. However, before Plato could get started he took an interest in philosophy, and went off to find Socrates. For the next 9 years Plato devoted his life to Socrates whose teaching methods can only be described as combative. Under Socrates system each subject was questioned, analyzed and defined. This method is called dialectic, which comes from the Greek word for discussion. Socrates began his teaching sessions by asking his pupil for the definition of a topic. He would then proceed to rip the definition apart by questioning. As a result, his pupils would discover the weaknesses and positive points. According to Socrates, philosophy had little to do with reason. Following the Peloponnese War the Thirty Tyrants took over Greece. At this time Plato was in a perilous place because two of the leaders, Critias and Charmides were his family members. Making things even worse was the fact that they ruled through terror, and Plato did not like it. Before long, the Tyrants had Socrates arrested on phony charges and sentenced him to death. As a result, Plato was forced to flee Athens for his own good. He moved 20 miles away to the neighboring territory of Megara. In Megara Plato studied under another former student of Socrates, Euclid. At this time he began writing in dialogue form. Probably the best known of these compositions was “The Apology” in which he describes the trial of Socrates. Plato studied with Euclid for 3 years more years before leaving for Cyrene in North Africa, where he studied mathematics under Theodorus. Plato would work on developing his Theory of Ideas or Forms throughout his life. He believed that the material world we perceive is in a continual state of change, and not the real world. Probably, Plato's best known dialogue is entitled, “The Republic.” The Republic features a cast of characters including Socrates. The group is gathered for dinner at a retired tycoon's mansion. Before long, Socrates takes over the conversation as he attempts to describe a just society. 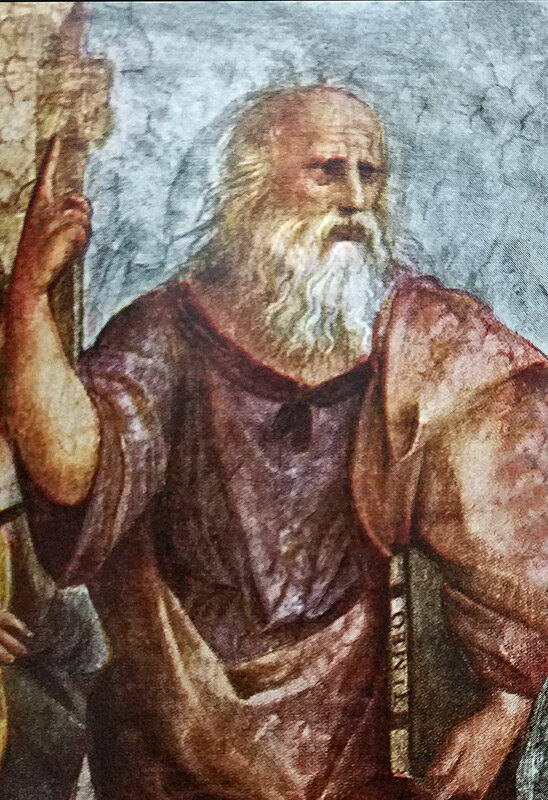 Plato believed that the human soul had three distinct elements; wisdom, conquest and distinction, and gratification. He also believed that the righteous man is governed by reason. In 386 B.C. Plato bought a parcel of land in the Grove of Academe, just northwest of Athens. At the age of 40 he developed one of the first and best known universities in the Western Civilization called the Academy. At the time, his best known student was Aristotle. Aristotle came to the Academy when he was 18 years old. When Plato died at the age of 81 years of age he was buried at the Academy. Shortly after his Plato’s death Aristotle left the school to teach Alexander the Great. Plato's Academy stayed open until 529 A.D. At this time it was closed by Emperor Justinian.